This gorgeous little gift book - now a New York Times best seller - from The Very Hungry Caterpillar is the perfect way to say "Happy Birthday!" Join The Very Hungry Caterpillar for a celebration of everyone's special day. 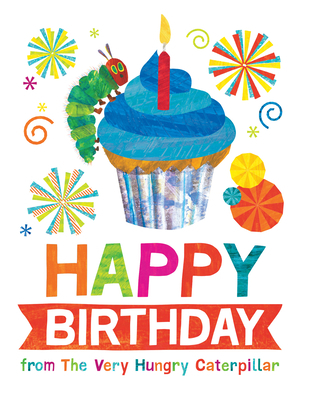 This beautiful book features Eric Carle's bright, colorful artwork of birthday surprises--from presents to balloons, and of course, cake--with The Very Hungry Caterpillar making an appearance alongside each one. This book is the perfect birthday gift for readers young and old. Eric Carle is acclaimed and beloved as the creator of brilliantly illustrated and innovatively designed picture books for very young children. His best-known work, The Very Hungry Caterpillar, has eaten its way into the hearts of millions of children all over the world and has been translated into more than 25 languages and sold over 12 million copies. Since the The Very Hungry Caterpillar was published in 1969, Eric Carle has illustrated more than 60 books, many bestsellers, most of which he also wrote.